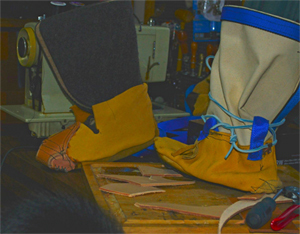 November 13, 2015: Moccasins for snowshoes that I am building. Each is one-of-a-kind when you don’t use a pattern. 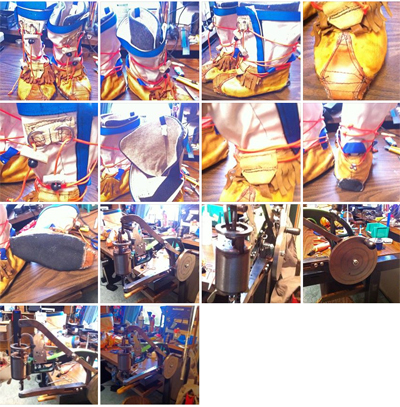 Designing a “steel-toe” to protect the toes…..diabetes has taken much of the feeling in toes so need to protect them from blunt trauma….will see how it goes with one and then try to duplicate. December 3, 2015: Moccasins for Snowshoes are done. The leather sewing machine was what allowed me to finish sewing these up. Started last winter but couldn’t continue with hand-sewing so left them. Started by learning how to use the sewing machine on the moccasins….perhaps not the best idea but…..they are not twins by any sense of the word….improvements, not rememberin how one was done….but I have had them out snowshoing once and brought them back for slight re-fits on ties and other……the sewing machine is pictured in the last of the series. December 7, 2015: Final Test of Moccasins. Having taken them out snowshoing I knew the moccasins fit feet well and a good fit to snowshoes I needed to know how then would perform without snowshoes…..It would be bad to be in backwoods and have a snowshoe break and find the moccasins were useless without snowshoes……I took them out on a snowmoblie track that was packed but with fresh snow….they gripped fine …. 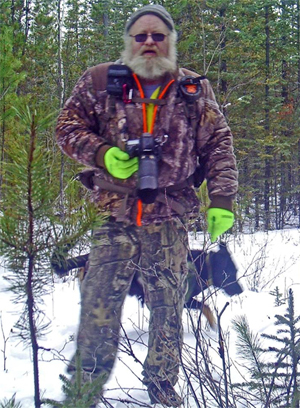 no slipping and sliding……then went up and down some steep areas on the snowmobile trail and again they gripped fine…..so they pass.